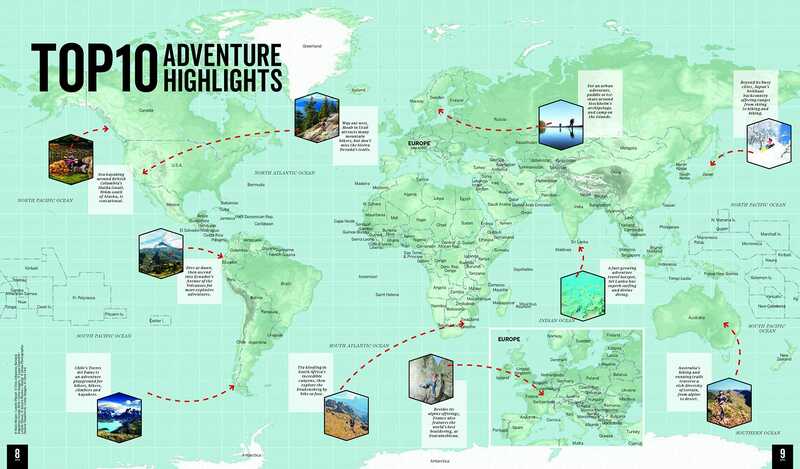 Thrill seekers and adrenaline junkies, Lonely Planet have released an Atlas of Adventure just for you. Lonely Planet’s Atlas of Adventure is the latest encyclopaedia with an aim to ‘Discover a World of Thrilling Outdoor Activities’. Don’t just walk on the wild side, but climb, ski, mountain bike, canoe, surf and even skydive – if that’s what you’re into, then get ready for Atlas of Adventure this October. Discover the best outdoor activities and experiences you can pursue in more than 150 countries across the globe. Atlas of Adventure is made up of tips shared by adventure-loving experts on their favourite places to experience thrilling outdoor activities. “This book is the result of an alphabetically ordered romp around the globe, highlighting the best outdoor pursuits you can enjoy in each country”, says Lonely Planet. Lonely Planet has included everywhere it’s currently possible to set your courageous foot. From less trafficked corners of popular spots to far-flung places you may never have considered visiting before. Lonely Planet devotes 18 pages to Australia’s outdoor activities, so you may even discover something right at your doorstep! Whatever the adventure you may be seeking, you will find it in Lonely Planet’s Atlas Adventure. For more information on the encyclopaedia, visit Lonely Planet online. Next Next post: Iconic Bose QC35 Headphones Just Got Better!